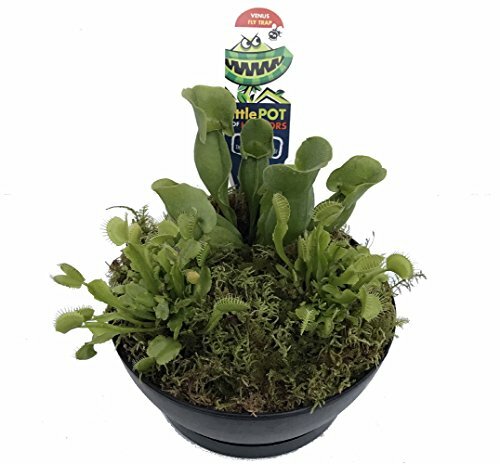 Live healthy adult sized Venus Flytrap Plant with a 4.5" diameter terrarium. Will have at least 3 traps on it, ready to gobble a bug! Terrariums come an assortment of bright colors. Comes with an easy care sheet and set up for beginners. A 'death trap' for insects! These plants 'trap' their prey with a clever hair-trigger mechanism. Once trapped, they are slowly digested. Please DO NOT ORDER if below 40 degrees or above 85 degrees in your area. Our live arrival guaranty will be void if ordered during these temperatures. YOU ARE RESPONSIBLE FOR CHECKING TEMPERATURES IN YOUR AREA to be sure your plant arrives alive. We ship this item via USPS (post office) within 4 business days. 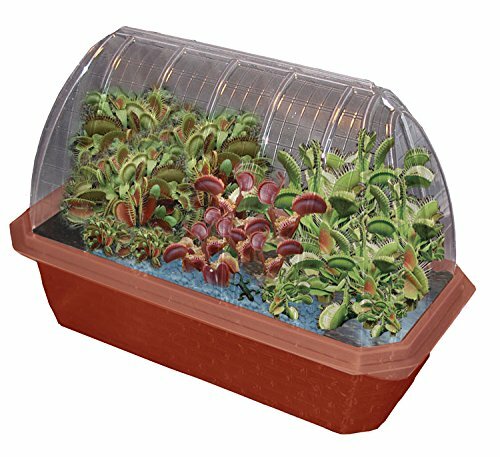 Grow over ten varieties of feared and famous meat-eating plants right in your own home. Watch as plants including the Cobra Plant, Venus Fly Trap, Pitcher Plant, Trumpet Plant and more, grow into bug-eating monsters right before your eyes. Then, decorate your bog with swamp rocks, colorful decals, bog buddies and decorative gravel and stakes. 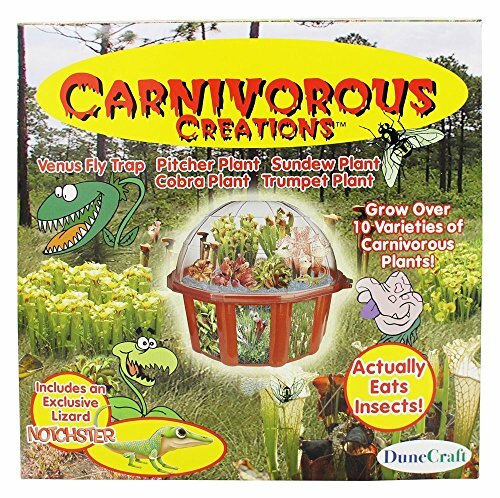 The kit also includes: a carnivorous seed pack, a growing dome, planting mixture and an instruction guide that includes details on all your new meat-eating friends. You'll fascinate your friends and family with your carnivorous greenery, which will flourish for years with the proper care. Note: This kit requires eight weeks of germination in a refrigerator. 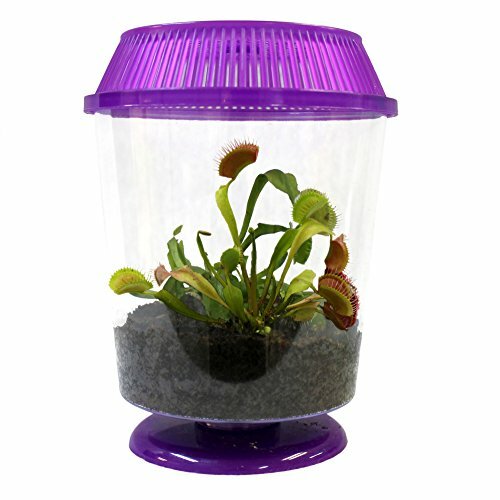 This deluxe terrarium has 2 healthy LIVE ADULT Carnivorous Plants, ready to chomp some bugs! Nice sized 2 to 3 inch adult plants. 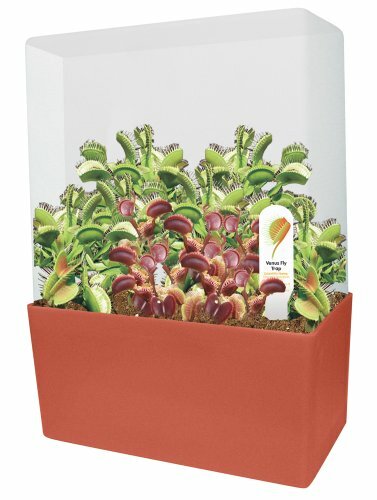 Venus flytraps will have at least 3 traps each. 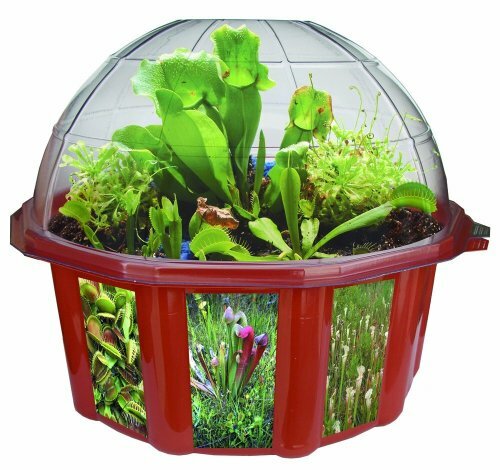 Watch these fascinating plants grow in the included peat planting mix and 1 gallon size planter terrarium with clear sides. 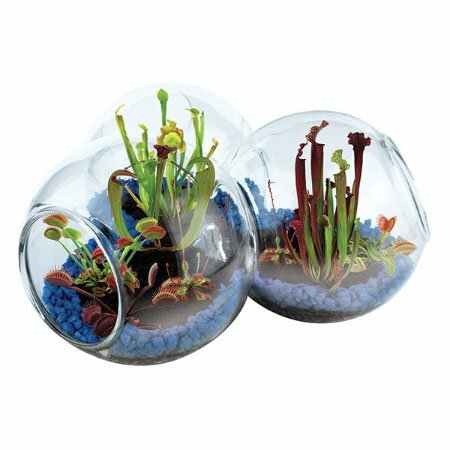 These carnivorous plants will flourish for years in this specially designed terrarium with proper care. Please DO NOT ORDER if below 40 degrees or above 85 degrees in your area. Our live arrival guaranty will be void if ordered during these temperatures. YOU ARE RESPONSIBLE FOR CHECKING TEMPERATURES IN YOUR AREA to be sure your plants arrive alive. We ship this item via USPS (post office) within 4 business days. There is nothing as elegant and alive as glass terrariums. They are fun to look at and even help clean the air! 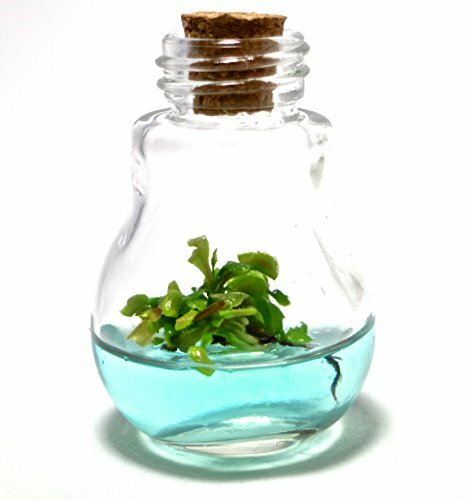 grow your own miniature world in our high quality glass terrarium. Simply add your soil, water, and seeds and watch your tiny garden come to li. Grow one of the world's most fascinating plants. Grow your own feared and famous meat eating plants. This terrarium features two of the infamous Venus Traps. The leaves of a Venus Fly Trap are covered with fine hairs. When an insect lands on the plant, the pressure on these hairs causes the jaw-like foliage to snap closed, trapping the insect inside. The diabolical Pitcher Plant. The unsuspecting insect crawls down the cylindrical stem and is unable to get out. The plant hairs all point down making an escape impossible. The hopeless insect is then slowly dissolved into plant food. Plus the plants are growing in live moss to add to the garden. Provide very bright, indirect light and keep moist with distilled water. Growing in a 6" garden with a saucer. Grow Fly Traps without soil. This complete kit comes with everything you need to get started. 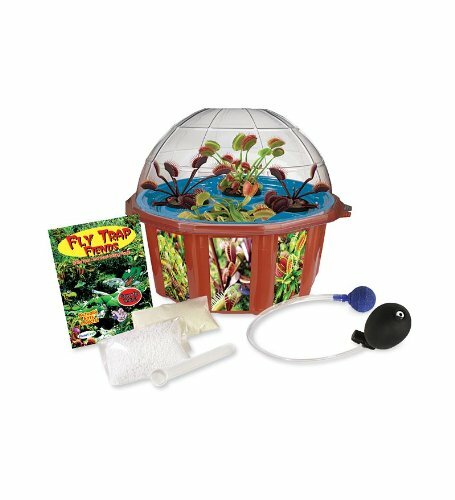 The Hydro-Pump is also included which will keep the water fresh and the nutrients available to the roots of your growing plants. Your plants will grow faster and bigger hydroponically than through any other means. Safe for ages 12 and up. Soooo I have not uploaded in a while and had this video planned for a while and decided to upload it! 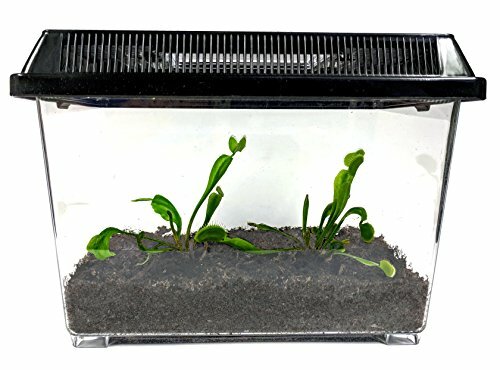 Compare prices on Venus Fly Trap Terrarium Kit at ShoppinGent.com – use promo codes and coupons for best offers and deals. Start smart buying with ShoppinGent.com right now and choose your golden price on every purchase.